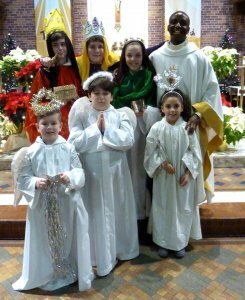 Please note that all students must be in religious education class starting from 1st grade through 8th grade (Level 2) in order to receive the sacraments of First Holy Communion, which is received in the 2nd grade and continue religious education through 8th grade (Level 2). Also, Confirmation is a 2-year program. Due to the high volume of students in our program, parents must be active and registered parishioners of St. André Bessette Catholic Church. Kindergarten class meet on Monday evenings from 6:00 p.m. – 7:00 p.m.
Grades 1st – 4th on Monday evenings from 6:00 p.m. – 7:15 p.m. Active Parishioners: $65; each additional child is $10. To register your children for religious education, please contact Vera Rodriguez, Director of Religious Education at vrodriguez@standreparish.org. All students must regularly attend Mass. We are always looking for volunteer teachers and teacher’s aides for classroom assistance. Please contact Vera Rodriguez for more information. Entrance: One-Way access from W. Jefferson Avenue. Exit: One-way via Outer Drive. Parents of children attending Monday classes must walk their child into the parish hall and pick up their child from the parish hall. No stopping in front of the door for drop offs or pickups. If Ecorse Public Schools are closed, due to severe weather, Religious Education classes are CANCELLED.